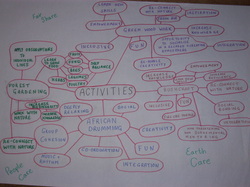 The mind map to the left explores a variety of activities that I am providing for the project participants. All the activities are intended to relax and inspire individuals and encourage group cohesion as well as all the while providing opportunities to re-connect with nature. Green woodwork - An entirely fulfilling and empowering experience on so many levels, green wood-working provides an opportunity to simultaneously develop new skills in the fresh air, working with living green wood amidst nature in addition to building a sense of community as the group experience socialising in a healthy relaxed and yet productive environment. Bushcraft - Increasing knowledge, skills and resilience whilst surrounded by nature, bushcraft is potentially an incredibly healing and empowering experience for individuals segregated from nature and community. Fireside morale in the fresh air promotes group cohesion and is quite simply fun! African drumming - A wonderful opportunity for all involved to relax and unwind fully, improving co-ordination whilst having great fun as a group experience, and to re-connect on many levels. I know just the man to deliver the goods! "Discussion of the healing effects of gardens and plants has been almost entirely limited to the valuable substances to be found in plants. The effects on healthy and sick human beings of garden work have only been investigated by environmental psychologists and horticultural therapists. There are very few empirical studies in the existing literature. Plants have a strong will to survive, and an outstanding ability to adapt and heal themselves. Plants have been known to produce whatever they need to survive: unusual roots; substitute parts; even getting water condensation on roots. Everything plants produce – including their shape and colour –inspires people. The garden allows us to think back to our roots and past. Gardens are often described as places of recognition, in which we can perceive, feel, consider and develop. Gardens create emotional experiences by providing access to life and development of the plants. 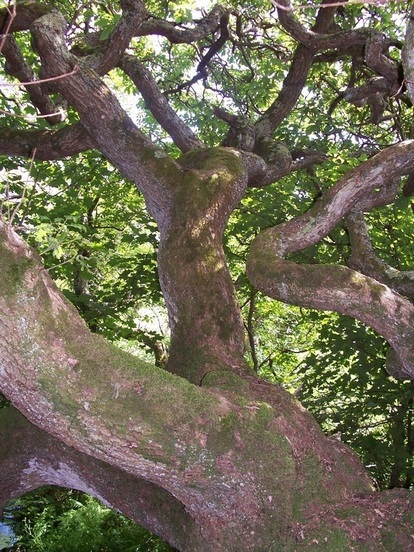 Most people can make the connection between the life of the plants and their own lives. Some people compare the ups and downs of their own life stories with the rhythms in nature. Both quietness and liveliness in gardens influence people. Human beings` physical and emotional powers are stimulated and strengthened by being in a garden. Harmony and vitality are increased, and aggression and longing can be constructively channelled. Gardens are nourishment for our life forces. They connect us to the process of life, through touch and movement, and through the opportunity to personally shape part of the environment." - Konrad Neuberger, teacher and gardener. As I need to progress with my work in my employment, the design process is integrated with the implementation phase of this project throughout. I will move back and forth between the design phase and the implementation phase as a consequence. One of the first in a series of outdoor activities that are intended to inspire the participants and help them reconnect with nature included a bushcraft session deep in the woods off the Gower coast line. I utilized the expertise of a good friend of mine, Andy Price, director of Dryad Bushcraft to deliver the session. The group learnt how to use a knife safely, as well as how to build a fire responsibly and also received workshops on empowering subjects such as friction fire lighting. The group benefited in many ways and visibly got a lot out of the day. Most of all though, for me the best result of the day was seeing the group bond and co-operate with each other in an integrated manner. Despite it being a cold February day, it was good to be outside. There were laughs and conversation around the camp fire as the group began to relax and integrate. For some present this would have been a considerable challenge in the segregated environment that they are accustomed to experiencing on a daily basis, very different from the integrated natural environment that they were now briefly jointly experiencing. The experience of the outdoor space and environment around them entwined with the additional experience of being part of the developing group cohesion around the fire allowed conscious space for creative, positive and productive thought as their routine daily stresses and concerns in life were briefly no longer immediate. The project participants have been working together to create a wet weather workshop at Margam Park. Two solid benches have been designed and built by the participants and fitted with bench vices. We plan to construct various items with the workshop. The participants can be involved with creating nest boxes for bird species, bats and invertebrate overwintering shelters for lacewings etc. In addition, bridge, fence and style repairs that are needed in the park can be undertaken at the workshop. As the participants skills improve, they will be able to increase the scope of the woodwork projects that they can undertake and choose their own projects. Things to do include the construction and organization of a tool store and a timber rack above the work benches. Inspiration from nature and the outdoor environment is a key feature of the project. The experience of learning new skills is clearly enhanced whilst immersed in the natural environment. A number of project participants have begun a gentle paced green woodworking Open College Network unit at the Down to Earth Project. The Down to Earth Project is a social enterprise specialising in Sustainability Education and Natural Building. Based on a beautiful site on the Gower Peninsula, Swansea, Down to Earth offer a range of groundbreaking programmes for young people and training programmes for adults in Traditional and Natural Building methods. As a centre for Sustainability Education (ESDGC), Down to Earth offer educational programmes and training for workers from informal and formal educational sectors. Down to Earth also work with schools and community organisations to design and build beautiful outdoor spaces using natural materials. Participants are encouraged to work together as a team, collaborating and co-operating with one another rather than competing. To the right, two participants assist one another with the process of making their own beetle. Beetle is the traditional term for a mallet that is made from a single piece of wood and commonly used in green wood work. A beetle is a very useful tool, and one which I make use of regularly. The participants learnt to select from a variety of green timber, and were given pointers regarding which pieces were most suited to the task. A beetle is used primarily in conjunction with a Froe to cleave green wood incredibly effectively. A froe is a wooden handled metal cleaver with a long blade. The beetle is used to strike the top edge of the metal blade of the froe and as a result needs to be made from tough wood. The participants learnt to select a piece of wood with which to make their beetle that comprised of knot free timber for the handle of the beetle (being easier to work with the axe or draw knife) as well as a knotty section for the head of the beetle. Knotty timber is very tough and so serves the purpose of the beetle head very well. If regularly used, a beetle will eventually become frayed and split, but if the head comprises of mainly knotty wood it will last longer. The beauty of such simple but useful green wood work tools as a beetle is that when it eventually breaks, it is simple enough to make another and the old tool can be used as fire wood or allowed to rot back in to the ground where it came from, producing no waste. Cooking pan cakes together around an open fire in a cob shelter and enjoying a warm mug of tea, the group chatted in a relaxed manner. Inspired by the examples of natural building that they had explored earlier, it was a pleasure to witness the emergence of new ideas and a thirst for more knowledge among the group. Once again the relaxed healing nature of the environment that they were amidst allowed them to relax to a far greater degree than they are generally able to in their daily lives. Project participants are made aware of where real food comes from and how it is produced. Here, a willing helper feeds the saddleback pigs at the Down to Earth project with organicaly produced feed. This stage of the project was all about implementation and maintaining that implementation, with a strong emphasis on observing, accepting feedback and acting upon it. As this particular project is ongoing and active, I will return to the design phase throughout. I chose African drumming as an activity as it has a multitude of potential benefits for those that take part on so many levels, but particularly I chose it as the prime project "tool" to develop group cohesion. My first experience of drumming in a group situation was with my partner, Alex, who has long been a member of a local drumming group. The group, Shiko, as well as putting on a great many community orientated performances throughout the year also hold an annual drum camp. The camp is generally held in a woodland and is a wonderfully grounding experience. Families and individuals all get together and visibly enjoy the experience greatly. Anyone can take part, but to really reap the benefits it helps to have an accomplished teacher on board. Such skilled tuition very quickly enables even those with minimal confidence to blossom, and grow from the "underdog" scenario to a beaming, smiling and fully engaged and inspired human being in a surprisingly short amount of time, right in front of you! It is definitely a group activity, and promotes co-operation and integration among those that take part like few other activities can do. "When many simple drum patterns mesh together they form a unified energy which is greater than the sum of the individual parts. I think it was Jim who described it by saying that when the patterns all align and sit perfectly together, the rhythm 'zogginates'. This powerfully demonstrates the need for all members of a team to pull together towards a common goal, and it's obvious when it's (not) working. Everyone's role is important for different reasons, and all are necessary to create the full picture. In a previously imbalanced team, this can be an empowering experience for people used to being the underdog, and perhaps a humbling one for management." The few sessions that we held with the group were most definitely a success and visibly benefited all who took part on many levels. I utilised a local provider, Boyd Erlam from Community sounds. Boyd has an open and relaxed, non-judgemental, very approachable manner and also has a natural gift for setting everyone at ease, and enabling a group to create some powerfully moving rhythms. I don`t think I have ever heard so much laughter, whooping, hollering and general celebration of life from the project participants as I did during some of the drumming sessions. I have absolutely no hesitation in recommending Boyd at Community sounds for anyone contemplating a similar project, and if you haven`t previously considered African drumming as an engagement tool, then I strongly suggest that you give it a go! Green woodwork has a multitude of therapeutic benefits. The process of taking a raw piece of tree and transforming it by hand into a beautiful piece of craft, using traditional techniques and tools, is not only deeply rewarding and satisfying, but also mentally, physically, emotionally and sensually stimulating. It’s also really sociable and fun! I chose to use two providers to deliver the greenwood working sessions. Dragonfly creations run by a good friend of mine, Scott Blytt Jordens provides the expertise necessary to gain a good basic understanding in green wood work. His mobile workshop can be set up at any woodland, and being outside in the woods for the day as a group is really the ultimate way to bring people closer to nature and allow their creativity to blossom. The Down to Earth project presented an opportunity to integrate basic green woodworking with other activities. A good working relationship developed between the group and our assigned Down to Earth instructor Barney O`Kane, and integration among the group developed very quickly as group members supported and assisted one another throughout. The group clearly demonstrated an increased effectiveness. Strong group cohesion, having first evolved during the African drumming sessions with Boyd Erlam, was plainly apparent and ever developing. A beautiful cob oven is on site, protected by a living roof structure that makes cooking possible outdoors, whatever the weather. Plenty of delicious pizzas made by the group, ably assisted by Barney. 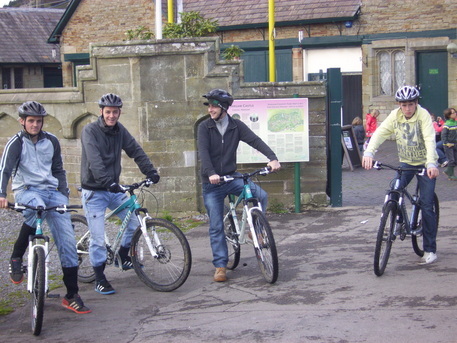 Everyone worked effectively as a functioning member of the group when undertaking tasks in the kitchen. The plaques on the wall to the left of the image here were all designed by groups that have previously visited the Down to Earth project. The designs were done using pyrography techniques on wood. Pyrography means "writing with fire", from the Greek "pur" (fire) and "graphos" (writing). Essentially, it is the art of decorating wood with burn marks using a heated element or friction in the case of a pole lathe. Having made their own beetles, (a green wood working mallet) the group then decorated them using pyrography. Creativity and artistic flare was abundant. The two beetles in the image to the left are certainly too good to actually use! Being out amongst nature whilst being empowered by a range of newly learnt skills is a wondrous combination that has a profound effect upon groups. 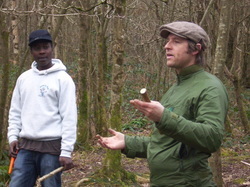 I once again used the expertise of my friend Andrew Price from Dryad Bushcraft to deliver bushcraft sessions. Friction fire lighting using a bow teaches patience, calmness, stillness and resilience. It is also good physical exercise that increases the heartrate. The moment just before the flames, smoke is rising well and the deeply profound satisfaction of making fire from friction is about to be experienced in the image to the left for the first time. Time to reflect together around the fire whilst the trout cook on skewers selected, cut and fashioned with a knife by the group members themselves. The group also lit and built the fire themselves. The experience was an empowering one for those that took part, and a calmness and increased confidence was plainly evident. A trout, cleaned and prepared in the woods is neatly pinned out on hazel skewers and about to be cooked in the fresh air around an open fire. Adding a variety of skills to the repertoire of the individuals in the group promotes the "jack of all trades, master of none" philosophy, markedly increasing resilience, self esteem and confidence. Comments such as "I`ll do this next time I go fishing for sure!" were nice to hear. Sounds of laughter and wonderment from around the fire and deep in the woods were heard throughout the day . The evaluation in this instance has been constantly evolving. My initial idea of a questionnaire at the beginning of the project and then at stages throughout has not been implemented, mainly due to the fact that writing is not the favourite occupation of the groups that I have been working with. The funding for my job relies upon an incredulous amount of paperwork, questionnaires and surveys. Adding to the list of "forms to fill in" would do little to increase enthusiasm for the project among the participants. African drumming ; Excellent for developing group cohesion and increased self esteem. A totally fun and inspiring engagement tool that had an almost instant positive effect. The only drawback to the activity`s use as an engagement tool stems from some people`s preconceived ideas about drumming. If you can get past that and succeed in persuading such people to attend once, they are almost certain to come again! Bushcraft ; Empowering and enlightening, bushcraft enables individuals to develop on many levels. Being in Wales (very green = generally pretty wet!) limits the activity to good weather days, unless a site can be secured at which tarps and shelters can be set up on a semi-permanent basis. Green wood working ; A firm favourite. Green wood working brings out the creative side of everyone that takes part. Similar limitations and how to deal with them apply as with bushcraft. Down to Earth project ; Well received. The fundamental factor that makes the Down to Earth project a success is that it is almost a "one stop shop." It clearly demonstrates a need for sites at which communities can engage in a non-judgemental setting in a variety of activities. Should someone not do too well initially at any particular activity, then they can try their hand at something else, and return to the former when feeling more positive. All the providers and instructors utilised have been deeply committed to their work, and demonstrated good people skills. This has of course significantly enabled the project to flow well. Forest gardening ; Unfortunately, the forest gardening project did not get off the ground. Despite the fact that funding was secured for the project to go ahead, the considerable amount of time taken by the local authority concerned in the decision making process has not allowed the project to proceed. It is a very great shame that it has not happened. Involving the groups in growing their own food whilst learning from the different perspective of forest gardening and working in harmony with nature was to be a key element of integrating permaculture design in to my work place. However, even with my "trump card" missing from the pack, I am still very pleased with the overall feedback and positive learning outcomes among the groups that I have worked with so far following the implementation and maintaining of the diversity of activities above. Despite the fact that the forest gardening project has not progressed, discussions with the group regarding the perspective project were a regular occurrence. Participants measured out the area and recorded the dimensions for the proposed project. Questions followed and several conversations over the course of time meant that awareness was raised regarding subjects such as composting, mulching, plant guilds, chopping and dropping, mushroom cultivation, beneficial insects, aquaculture, natural building and integrated animal systems. In addition to the groups discussed above, I also worked with another group of people through the mental health team of the Local Authority. In order to respect the privacy of those people involved I have not catalogued this part of my work here. The work was based at an allotment site that was in an advanced stage of re-colonisation by weeds. In my very short time with the group, all present developed a firm grasp of the sheet mulching technique using cardboard weighted down with organic matter and surface mulching with hay, straw or whatever was available. All became familiar with the term Permaculture and many seemed interested in researching it further, particularly liking the reduction in heavy manual labour provided by the people care aspect of sheet mulching rather than digging. At this stage of the project, my employment is about to change. I am about to embark on a new job with different objectives. 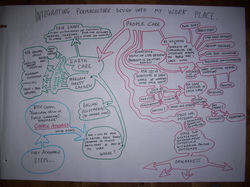 Rather than spend time tweaking something which will not be continuing in it`s present form, I will return to the beginning of the design process following reflection upon what I have learnt so far during this project "Integrating Permaculture Design into my workplace". I feel confident following feedback that the activities that the groups engaged in during my work above have planted seeds of interest among all that took part. Some of them have discovered talents that they were not previously aware of. They all have a multitude of skills and talents of course, and trying new things has allowed these talents to shine through. I hope that the experiences cited above have reinforced the "jack of all trades, master of none" philosophy among them, and that they may all be a stage closer to realising how limitless they all are and what they are capable of achieving for themselves. Things are constantly evolving, and this unexpected change in employment will be an interesting one and will diversify my application of integrating permaculture design at work.